There are few activities more American than watching baseball, but in Miami, extreme weather can put a damper on the beloved summer pastime. One way to ensure that the game goes on? Design a retractable roof system that allows for a variety of configurations. 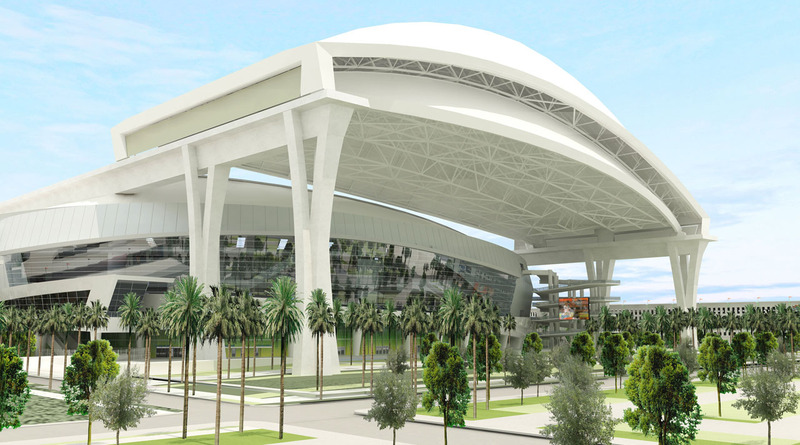 The new Florida Marlins ballpark, designed by Populous (formerly HOK Sport), will replace the Miami Orange Bowl, a landmark structure built in the 1930s in the Little Havana neighborhood near downtown Miami. Populous aims to tie the ballpark, a typology that tends to be bulky, into its context: “The building was conceived as an abstraction of water merging with land, symbolic of Miami’s coastal landscape.” The ballpark’s form is simultaneously sculptural and modern, clad with white stucco. At the stadium’s base colorful mosaics, inspired by the work of Spanish artist Joan Miró and honoring the neighborhood’s Latino heritage, will draw pedestrians toward a retail arcade. 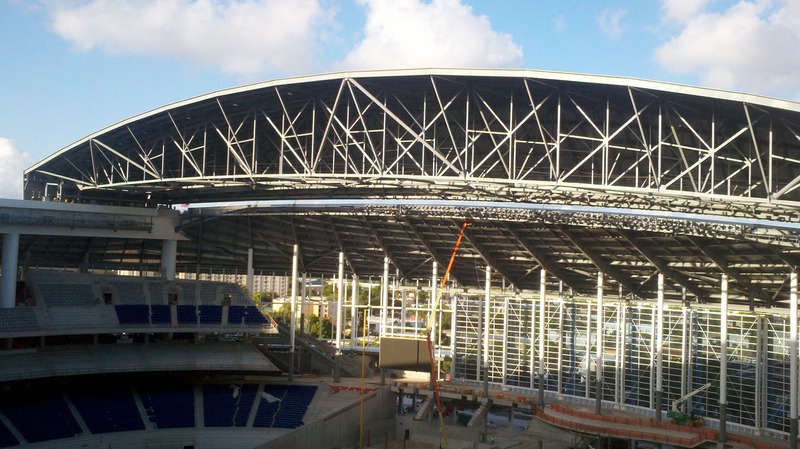 Inside the stadium, 37,000 bright blue seats remind spectators of their proximity to the ocean, while giant sliding glass and metal panels reveal views of the skyline. The designers created wide concourses with large balconies that open onto the field, so taking a hot dog break doesn’t interrupt watching the game. 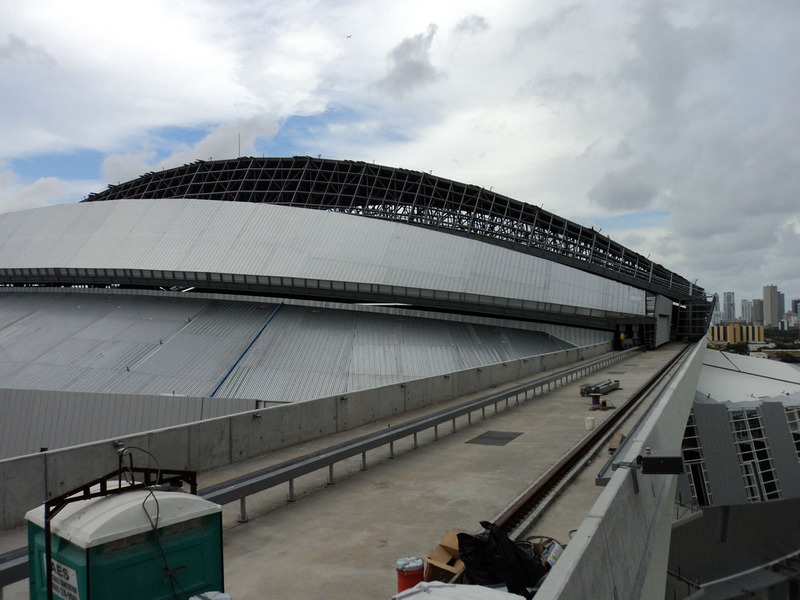 The defining feature of the stadium, of course, is its huge retractable roof; it is the sixth Major League Baseball stadium in North America to incorporate this technology. 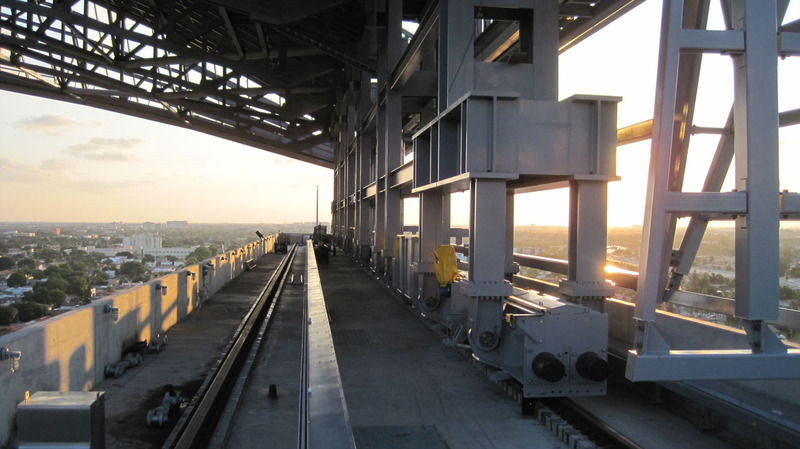 Responsible for the roof’s mechanization is Uni-Systems, a company that advocates “Kinetic Architecture.” They initially designed hangar doors for aerospace facilities and later covers for outdoor pools and amphitheaters before specializing in stadium roof designs, including Reliant Stadium, Minute Maid Park, University of Phoenix Stadium, Lucas Oil Stadium, and Cowboys Stadium. 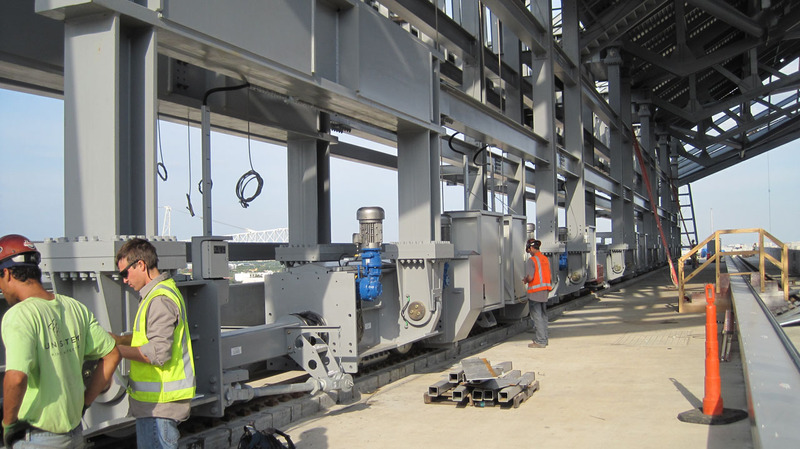 Uni-Systems worked closely with the architect to develop a concept: “We’re the ones who make it move; we design what the equipment looks like,” explains Alan Wilcox, a Project Engineer with Uni-Systems. 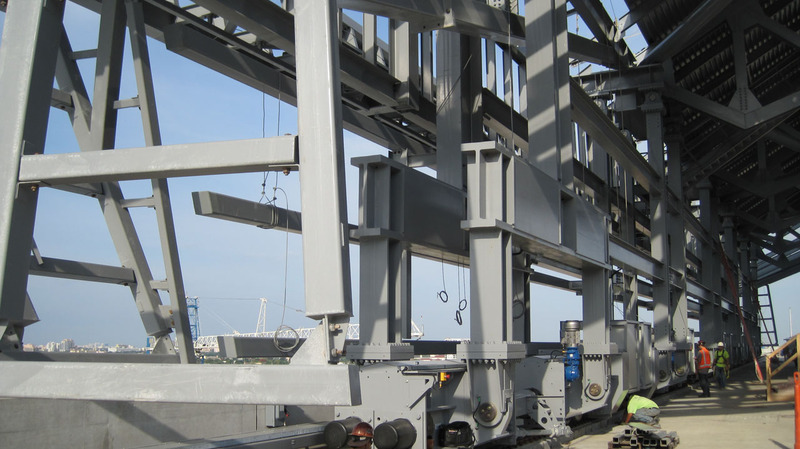 The roof structure of the Florida Marlins’ ballpark will be supported by several 130' tall reinforced concrete “super columns.” The movable portion of the roof structure is comprised of three panels, one upper and two lower, for a total surface area of 338,000 sq. ft. The panels are made of metal roof decking with a TPL membrane, and they can operate together or independently. In one configuration, the seating is entirely exposed; in others, it can be partially or completely shaded. 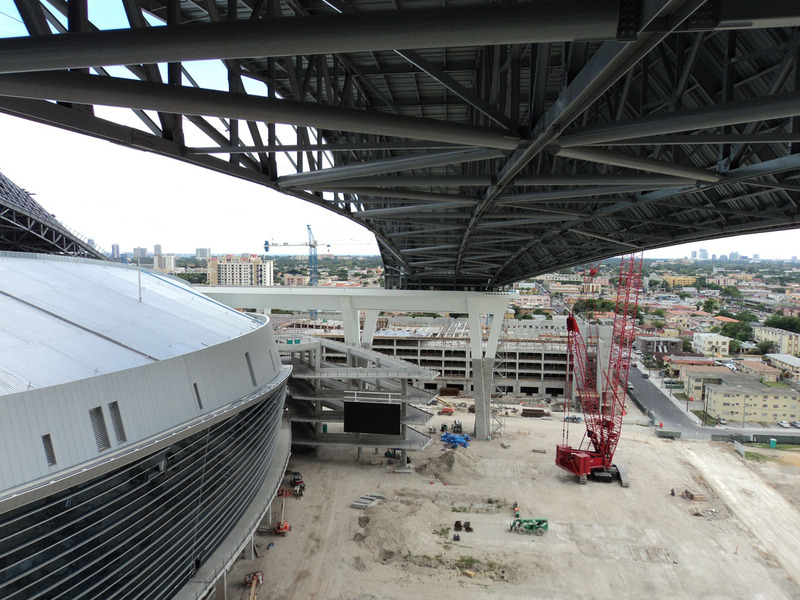 The retractable roof provides protection not only from the brutal tropical sun, it also withstands hurricane conditions of up to 150-mph winds. The roof panels weigh a whopping 19 million pounds, but, according to Wilcox, “They must be heavy-duty in order to handle those kinds of winds.” An opening in the center, with an area of 280,000 sq. ft., lends visual lightness to the structure and allows sunlight to reach the natural grass field. 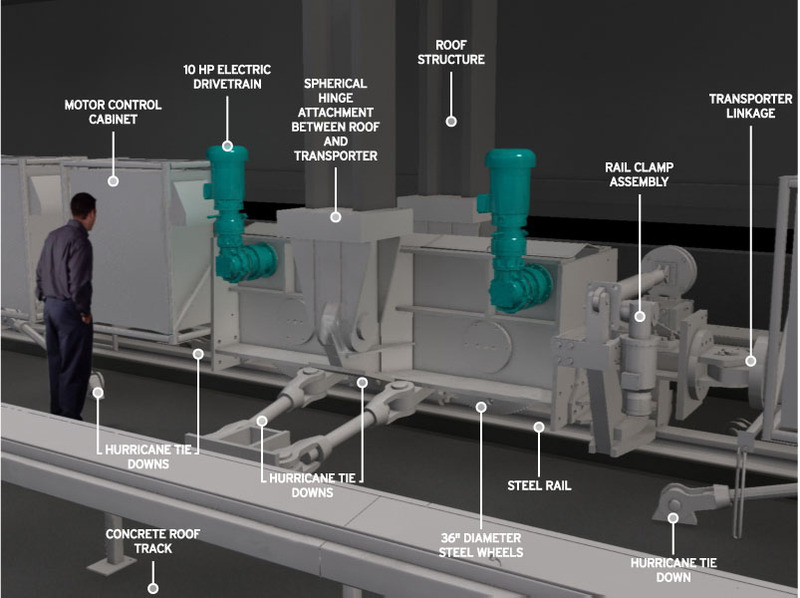 The roof is electrically powered and a system of sensors and cameras report on its progress, so it can be operated by a single person within a control room. Forty-four transporters move the panels, and each contains a pair of 36" diameter wheels that move along rails, much like a locomotive. 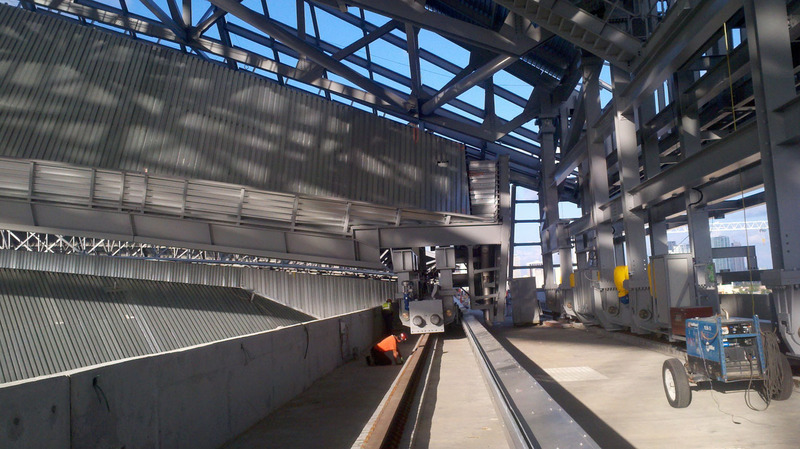 The panels move a maximum of 39' per minute, allowing the entire structure to open or close in less than 15 minutes. 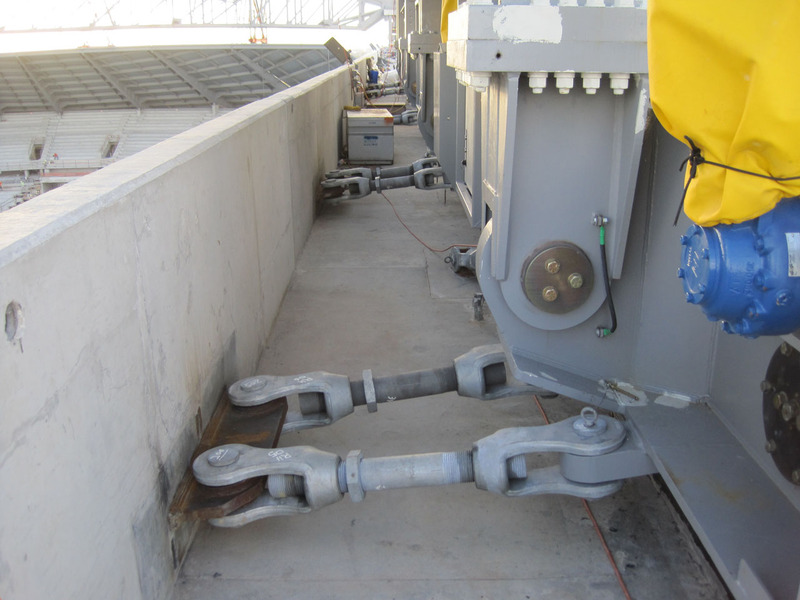 Thanks to regenerative drives, which feed energy back into the power grid while the roof system is braking or being pushed by winds, it costs less than $10 each time to operate the roof. 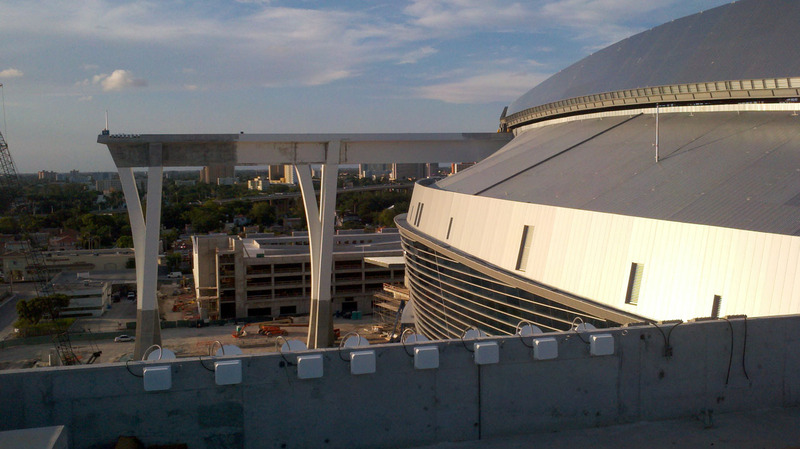 Although a telescoping roof is not exactly a new concept (Uni-Systems took a similar design approach with Minute Maid Park), the unique aspect of the roof design, according to Wilcox, is how successfully it ties into its context. 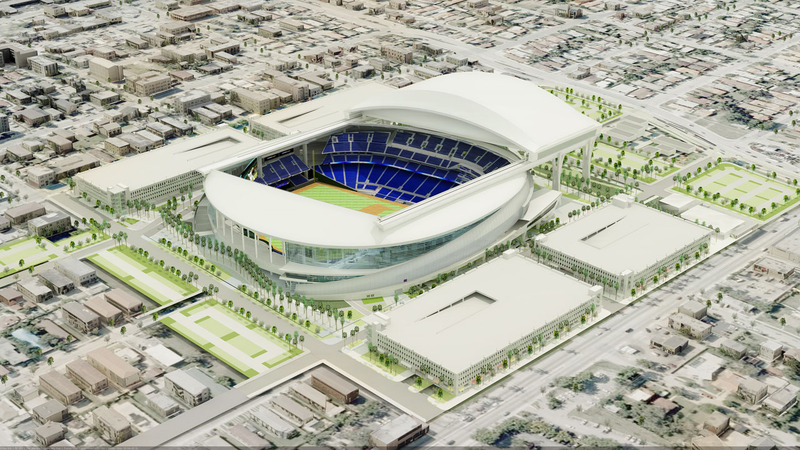 Little Havana is a low-rise neighborhood, and Populous wanted to avoid creating an enormous ballpark that appeared out of scale, so they made the roof structure as contoured and sleek as possible. However, this “created a bunch of cantilevers with the panels, and it is skewed diagonally with one side sliding 60' ahead of the other,” explains Wilcox. While this created additional challenges for Uni-Systems, they were able to make the mechanics work. In order to keep the design looking aerodynamic from the interior, too, they coordinated closely with structural engineers Walter P. Moore to select structural tube members. The result is “very clean-looking from the inside,” according to Wilcox. 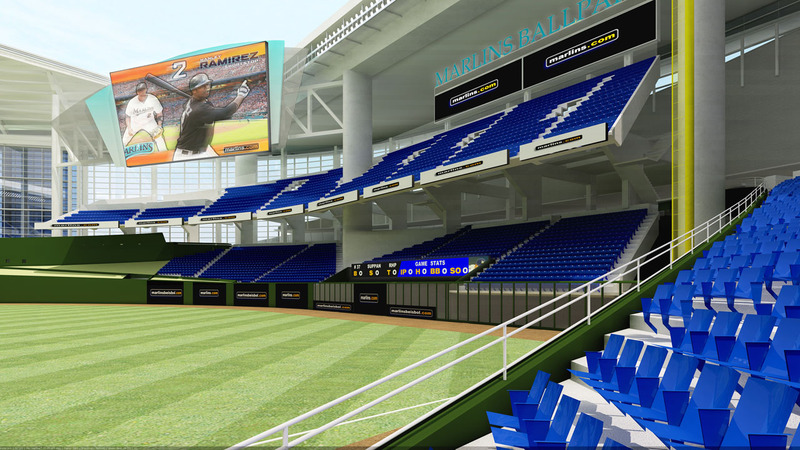 As a further gesture to the community, Marlins owner Jeffrey Loria commissioned several art pieces for the stadium. 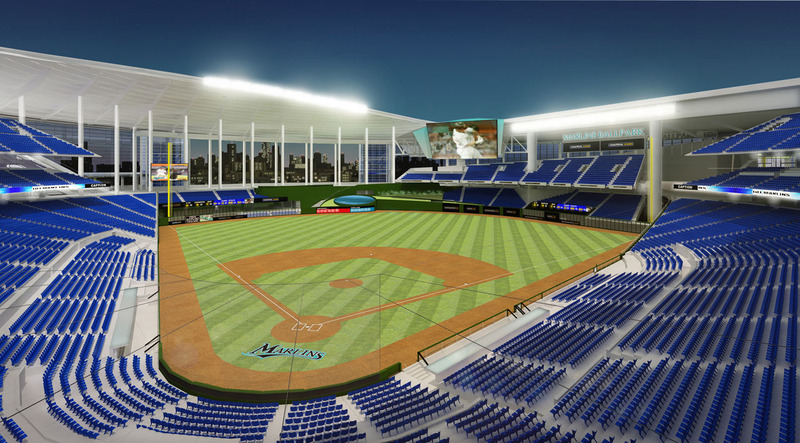 Aside from the mosaic work on the ground floor, the ballpark will also feature a home run water feature designed by Red Grooms, aquariums lining the Marlins backstop behind home plate, a paving design by pop artist Carlos Cruz-Diez, and a commemorative marker for the Miami Orange Bowl by Daniel Arsham/Snarkitecture, who also designed an LED lighting scheme for the super columns. The ballpark is projected to attain LEED Silver certification, thanks to an aggressive construction waste management and recycling program, as well as the incorporation of local and recycled materials and the use of low-VOC finishes. 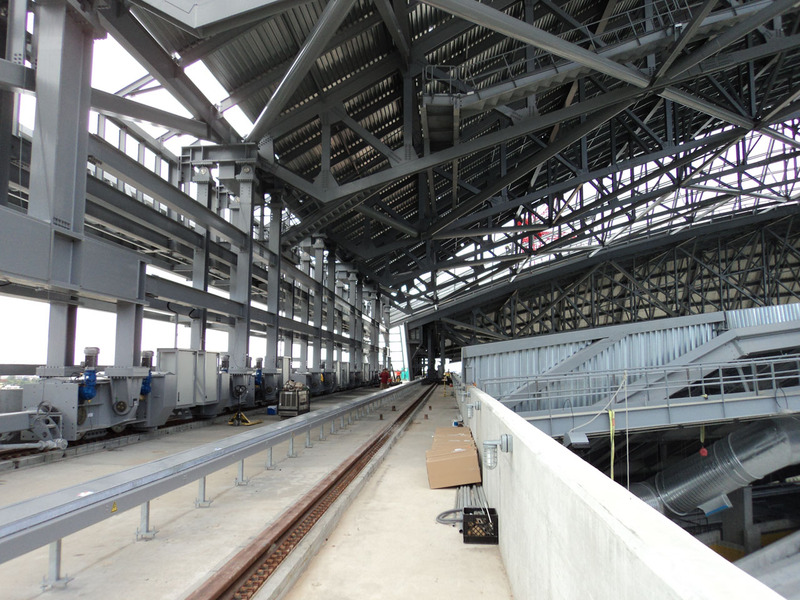 It is scheduled to open in April 2012. Play ball!